San Giacomo's name, dall' Orio, probably comes from a laurel or bay (alloro) tree that once grew here. It's not the most prepossessing Venetian church from the outside (it's one of many churches that are hard to take in as a whole) but well worth a look within. Founded in the 9th century, this church and its campanile were rebuilt in 1225 to house booty from the Fourth Crusade: a pair of columns, one a massive and rare piece of verde antico (in the right transept) that both Ruskin and Gabriele D'Annunzio greatly admired. Crowned by a magnificent, nearly seaworthy 14th-century ship’s keel roof – built to limit the church’s weight on the swampy ground – the church is another Old Curiosity Shop of Venetian memories, beginning with a quatrefoil stoup of Greek marble and, in the right transept, a wall of the original church, embedded with sculptural bits from Venice’s past. A rather sombre Madonna and Four Saints by Lorenzo Lotto presides over the high altar; it was his last painting in Venice before he left the city. Here too is Lorenzo Veneziano’s crucifix and two marble crosses in the Lombardo style, and Lombardesque red and green geometrical patterns continued around the sanctuary. On the pier to the left of the altar, there’s an unusual Virgin Annunciate, one hand raised in friendly greeting, the other holding a spindle; still to the left of the altar are two large black and white 13th-century frescoes of Daniel, perhaps, and David. Although the gate of the old sacristy on the far left is usually locked, you can look through the bars to see its numerous Palma Giovanes and Buonconsiglio’s Three Plague Saints. 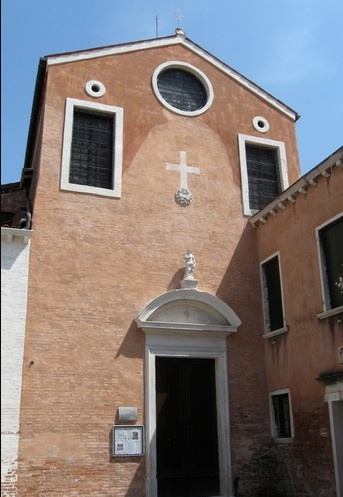 The left transept has a painting by the workshop of Veronese, of SS. Jerome, Lawrence and Prospero on the altar, where you’ll find the light switch to illuminate its saints and rain of putti bearing martyrs’ palms; on either side are Palma Giovane’s Scenes from the Life of St Lawrence, on the right presenting the Roman authorities with the ‘treasures of the church’ that they had demanded (he brought them his poor and wretched); on the left Lawrence is toasting on the grill for his brave gesture. If the sacristan is about, he’ll open the new sacristy, with Veronese’s The Doctors of the Church and Faith, and Francesco Bassano’s St John the Baptist, who is portrayed preaching to the Bassano family and Titian (on the far left, in a red hat). San Giacomo is a Chorus church.